Waghorn Guitars is a UK custom shop luthier creating the finest quality handmade acoustic and electric guitars and basses to order. The only specification that comes as standard with a Waghorn guitar is quality. Every other aspect is customized to your personal tastes and sonic and visual requirements - provided that the design, build quality and technical functionality of the instrument can remain uncompromised. We construct every neck by hand from multiple laminates using quarter-sawn timbers for strength and stability whilst utilising the best quality tonewoods, hardware and pickups available from across the globe. Choose one of our three disciplines: Acoustic, Electric or Bass - to see design and ordering information on each plus galleries showcasing examples of our custom guitar work. If you don't want to wait for a custom build or would like to see our work in the flesh, see what guitars we currently have in stock ready for sale. Waghorn Guitars will be at UK Tech Fest 2018 from the 5th to the 9th of July 2018 at the Newark Showground in Nottinghamshire. Come down and say hi! A long overdue gallery update! This Corax 6 string features a Mahogany body, bolt-on Indian rosewood and flamed maple neck. Bare Knuckle Nailbomb and Cold Sweat pickups with black Battleworn covers, Hipshot bridge and knobs, Schaller M6 locking machines. This neck-through Sauria B 4-string bass has also been added. Cocobolo top and fingerboard, maple and wenge neck, swamp ash body wings, Delano PC 4 AL and Delano MC 4 Jay-Ray pickups, ABM bridge. We hope to have more photos added soon, but in the meantime head over to our Facebook page to see some more recent guitars and work-in-progress photos. The first custom-ordered Ion-w is now on the Electric Guitar Gallery featuring a Roasted Birds Eye Maple neck, a striking Burr Maple top, Bare Knuckle 'Rebel Yell' pickups, a Gotoh tremolo and Schaller locking machine heads. This guitar is also the second to feature our new 'Tracer' illuminated hollowpoitn side dots (the first was the original Ion prototype). The Alex Hutchings AH6 range of electric guitars has been updated for 2015 to include new customizable options. Customers can now choose from a greater selection of different top, body and neck wood options, different bridges from Gotoh and Hipshot as well as fingerboard and inlay options. Also added is the new 'Drop Top' arm chamfer style and different midi pickup choices. Alex visited the workshop shortly before flying out to NAMM 2015 to check out the first guitar to showcase the new options, destined for a UK customer. "This is by far the best AH6 to date and I'm super thrilled with it... the look, feel and sound quality are up there with the finest guitars I've ever played!" The end of 2014 saw the birth of a new electric model - the T-Rex. Check out the first version in the Electric Guitar Gallery, a Birdseye maple and Wenge neck-through body baritone 7 string with a fetching transparent green quilted maple top, fully scalloped rosewood fingerboard, Hipshot contour tremolo and Bare Knuckle 'Trilogy suite' pickups. You can also read what the proud owner had to say about it on our Electric Testimonials page. The Electric Guitar Gallery has been updated with a Corax 6 string featuring a reversed headstock, modern set-neck construction, bookmatched Brazilian Mahogany body, 1-piece quilted Sequoia top, 5-piece Flamed Maple/Wenge neck bound in Flamed Maple, Ziracote Fingerboard with Koa offset square inlays and hollowpoint side dots, Schaller Hannes bridge and M6 locking machine heads and finally Bare Knuckle Juggernauts pickups with Zebra bobbins. The Electric Guitar Gallery has been updated with the first example of a new model, the Sauria J. Designed as a semi-hollow wide-bodied jazz guitar, this design aludes to the classic styles yet retains a modern edge with our signature comfort and playability. This example features a flamed maple and Wenge 5-piece Traditional Set-Neck with a semi-hollow Swamp Ash body and a stunning quilted maple carved top. Nickel finished Schaller hardware completes the vintage look while DiMarzio PAF Joe / Mo Joe pickups provide tonal versatility. See the links below for more photos and information. The Electric Guitar Gallery has been updated with a Sauria S 6 string featuring lightweight Mahogany body and neck woods, 5-piece neckthru construction, a hybrid-carved Spalted Maple top and Rosewood fingerboard. The Hipshot Contour tremolo is loaded with Graphtech piezo saddles and their Acoustiphonic preamp system, while the magnetics are handled by Dimarzio. This guitar also features a Tronical robotic tuner system and Luminlay glow-in-the-dark Hollowpoint fingerboard and side dots. The Bass Guitar Gallery has been updated with an RD Artist 4 string. The customer wanted the RD shape and all-maple construction but with the high-spec decorative features of a Les Paul Supreme. Featuring a 5-piece Plain Maple / Wenge neck-through construction, maple body wings and a high grade flamed maple carved top, fully bound with purfling. Split-block mother of pearl inlays adorn the ebony fingerboard while a custom gecko inlay crests the Waghorn Arched headstock. The pickups come from SGD Lutherie while the 3 band EQ is by AC/East. From late May 2014 there will no longer be a repair or set-up service based at Waghorn Guitars other than for our own instruments. We will however continue to offer acoustic and electric pickup fitting as well as some hardware upgrades alongside our custom shop guitar work. Please contact us for details. For over 10 years Simon of Si.Co Setups has been operating alongside luthier Tom Waghorn providing guitar set-ups for the guitarists and bassists of Bristol and surrounding area and is continuing to do so from a new workshop. Please visit sicosetups.co.uk for more information. Our current resident repair technician Dave Rowlinson is also shortly moving to new premises and is no longer accepting new work at the Waghorn workshop. Please see his website guitarrepair.co.uk for information on his future instrument repair service. Waghorn Guitars would like to thank both Simon and Dave for their work at Waghorn Guitars as well as all of our repair and set-up customers over the years. Meanwhile our custom guitar work continues; the Electric Guitar Gallery has been updated with a modified Sauria six-string. Featuring a semi-hollow Black Limba body with a carved Flamed Maple top, Flamed Maple/Wenge neck with a Ziracote fingerboard and headstock facing/back and a custom inlay design, Pigtail wrap-around bridge, Bare Knuckle pickups and Gotoh SG510 machine heads, this guitar is a blend of the classic and the contemporary truely individual to the customer's specification. 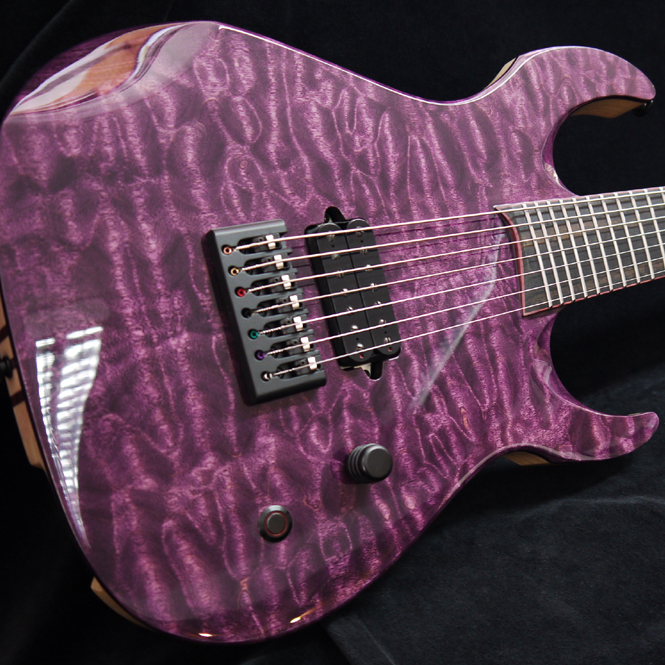 The Electric Guitar Gallery has been updated with a Corax 7 string featuring a 7-piece Flamed Maple and Purpleheart neck-through construction with a Purpleheart-bound 26.5" scale Ebony fingerboard, Swamp Ash body with a trans-purple Quilted Maple cap and matching facing on the bound Corax reversed headstock. A Bare Knuckle Aftermath pickup provides the power while the solid brass ETS fixed bridge works to provide massive sustain alongside Gotoh SG machine heads and a Graphtech Black TUSQ nut. The Bass Guitar Gallery has been updated with a Kelly-style 4 string. Featuring modified body geometry to accommodate the 35" scale, 24 fret fingerboard and yet not suffer from neck-dive as many body shapes in the 'Explorer' family are known for, this bass is comprised of a 5-piece Plain Maple / Wenge neck-through construction featuring our signature extreme shape carved heel (as seen on our Deity electric guitar model) and scalloped horn for easier upper fret access. Swamp Ash body wings with Quilted Maple caps sit either side the top-visible neck-through block. The hardware is an ABM 3704 brass bridge, Seymour Duncan SPB-4 Steve Harris signature P-bass pickup with stripped down electronics (just a single volume knob and no tone or EQ controls whatsoever), Gotoh machine heads and Schaller strap locks. Completed with a striking trans-white gloss body (but satin neck) finish with black bevels to tie in with the bound headstock and Ebony fingerboard which features a custom inlay in mother of pearl and brass. The Electric Guitar Gallery has been updated with a Corax 7 string featuring Neck-through construction, a satin finished Swamp Ash body with a gloss transparent honey-brown quilted Maple top featuring reduced Corax scallops and bevels, a 5-piece Wenge / Paduak / Plain Maple / Walnut veneer satin finished neck with a stainless steel fretted ebony fingerboard bound in Flamed maple with walnut veneers, brass fingerboard dots, hollowpoint side dots and Schaller M6 locking machineheads. Bare Knuckle 'Blackhawk' Pickups, ETS 'Tuning Fork' individual fixed bridges and Planet Waves strap buttons. The Electric Guitar Gallery has been updated with a Kronos 6 string featuring our Modern Set-Neck construction, a satin finished Swamp Ash body with a gloss transparent blue quilted Maple carved top, a 5-piece Flamed Maple / Ebony / Plain Maple satin finished neck with a stainless steel fretted ebony fingerboard, hollowpoint side dots and Schaller M6 locking machineheads, Bare Knuckle Pickups, ETS fixed bridge and Dunlop Flushmount strap locks. This guitar also features the first example of our new Kronos S headstock, a narrower version of the standard Kronos headstock. Also added is this 'fireburst' Doublecut, a replica of a stock guitar we made a few years ago but with a few minor custom design and specification changes. Essentially though it is still the same guitar with Neck-Through construction, DiMarzio PAF Joe / True Velvet / Mo'Joe pickups, Wilkinson by Gotoh 2-point floating tremolo, Sperzel locking machineheads and striking Maple Burr top finished off in a gloss 'fireburst'. The Acoustic Guitar Gallery has recently been updated with several newly completed OM and Hydra models representing different ends of the spectrum of specification options. These guitars are of course completely customized to suit the customers' needs including options such as wood choices, custom body depth, an arm chamfer, a bear-claw spruce soundboard, headstock shapes, gloss and satin finishes as well as different levels of decoration. Take a look at these and other examples of our practically limitless acoutic guitar customization options. A RS Dreadnought has been added to the Acoustic Guitar Gallery featuring Indian Rosewood back and sides, an aged European Spruce soundboard and Koa binding. Also added to the site recently was a 27" baritone electric SG, featuring a single-piece Mahogany body, a single Bare Knuckle Warpig pickup and a custom inlay. Check it out here: Electric Guitar Gallery. Introducing the Sauria S - a slimmer, sleeker, sportier version of the Sauria. It's smaller body, longer top horn and shorter bottom horn lend a new dimension to the Sauria shape. This first custom example of the Sauria S features Black Limba body wings on a 3-piece plain and flamed Maple neckthrough, a striking figured Walnut top with a violin carve (instead of the usual Sauria carve), Graphtech piezo-loaded saddles on a Gotoh 510 tremolo, Bare Knuckle Warpig pickups and Sperzel Locking tuners on a Corax headstock. This guitar also features an unusual custom split/staggered/dual nut which we developed with the customer, essentially simulating a permanent capo at the first fret on the bottom 4 strings only for his custom tuning. A modified Sauria has just been added to the electric gallery. Featuring a semi-hollow Swamp Ash body, a violin-carved Maple burr top featuring our modern styled bass side F-hole. The customer requested a slightly shorter bottom horn for better upper fret access and a modified headstock plus a couple of other personal touches to truly make this Sauria his own. Seymour Duncan Jazz/JB pickups sit nect to the Roland GK3 Midi pickup system and a Gotoh SG510 tremolo, and Schaller Locking machine heads anchor everything at the end of the 5 piece flamed maple, plain maple and wenge neck. The Acoustic Guitar Gallery has been updated with a OM style acoustic in Indian rosewood. Featuring our full rose headstock and fingerboard inlay, the guitar is finished of with Koa binding, Schaller Grandtune machines and a Headway HE4 undersaddle pickup. Waghorn Guitars has collaborated with Jazz/Fusion guitarist Alex Hutchings to produce the new AH6 electric guitar which is now available to order. Alex's mission to find the perfect balance of body design, pickups, hardware and aesthetics to suit his style has seen him very much involved in the design and prototyping process that has brought the AH6 from its inception to the current specification. The first example of our new offset V model - the Deity - has just been completed. Our usual options are available with this shape (more details to follow soon) but this example is a Mahogany bodied, five-piece maple/wenge neck-through loaded with the new Seymour Duncan Nazg�l (bridge) and Sentient (neck) pickups, an Original Floyd Rose 7 string tremolo and finished off with Gotoh, Hipshot and Dunlop hardware and a custom inlay at the 12th. The body and headstock fronts are finished in gloss black while the rest of the body is satin black, with a trans black neck-through. Recently completed is this seven string RR style neck-thru V, loaded with a Seymour Duncan Distortion in the bridge and a SSL-5 single coil in the neck. Featuring a 5-piece plain maple and walnut neck with Swamp Ash wings, this is the first V we have produced with our new ergonomic sculpted neck-through heel for a killer combination of effortless upper fret access and neck balance. Finished off in gloss black with an Original Floyd Rose tremolo. 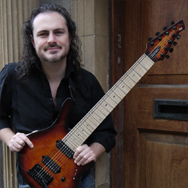 Josh McMorran of UK death metal outfit Bloodshot Dawn has posted this video of a demo song play-through on his 7 string Quantum V with an introduction his guitar and the rest of his gear. We've added a new bass to the Bass Gallery a monsterous 6 string Sauria Bass, featuring a Swamp Ash body, Ziracote top, a 5-piece Plain Maple and Wenge bolt-on neck, hardware from ABM and Gotoh and powered by a Delano MC 6 pickup. We've added another guitar to our current stock, this one a budget oil-finished Kronos 7 string featuring a one-piece Mahogany body in 'worn black', DiMarzio D-Activator pickups plus an ETS fixed bridge and Gotoh SG machineheads. The Kronos design has also been updated slightly with an asymmetrical body carve and deeper horn scalloping to allow greater upper fret access and bring it in line with our other models. This guitar also sees the introduction of a new type of Set-Neck join available on the Kronos and Corax, the increasingly popular glued-tenon join in conjunction with an 'all-access' carved heel - for those who want the upper fret access of a through-neck construction but without the price tag or removal of too much body tonewood. » Stock Guitars. The last guitar of 2012 is another unusual build for us; a Hydra with a Quilted Sequoia (redwood) top, figured Walnut back and sides bound in Koa. The 3-piece Flamed Maple and Koa neck feature a custom asymmetrical neck profile, and the lack of inlay and purfling on the fingerbaord and body let the figured woods speak for themselves. Finished off with Gotoh 510 tuners and an LR Baggs pickup system. The first acoustic guitar to leave the workshop in a while is a fairly unusual beast; a multi-scale 'fanned fret' mini-jumbo nylon strung classical guitar complete with a cutaway. The customer utilises the low E and A strings tuned an octave lower to accompany his playing with bass lines, and the longer bass-side scale is intended to reduce the string tension problems experienced when tuning low with a standard single-scale guitar, in conjunction with some custom string guages. The birdeye maple neck, back and sides is finished off with Schaller machineheads and a Headway classical pickup. Early November has seen the completion of some more electric guitars, including an overtly metal neck-through 'aged/relic' LP with a Schaller Floyd Rose tremolo, Bare Knuckle Nailbomb pickups and custom graphics. Also finished (and looking less abraided) is a Double Cut variation with a quilted maple top finished in Aegean blue and Seymour Duncan '59 pickups. A new demo song of the 8 string Corax is now available on our Multimedia page - for more information including the full specification and pricing see the Guitars In Stock page. The chaps at Sonicstate.com have conducted a double video review of the Kronos and Brazilian rosewood Double cut six-strings currently available on our Stock Guitars page. 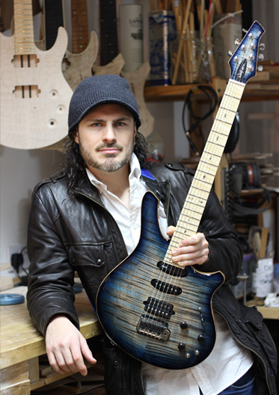 We have spent the last 6 months designing and building a custom guitar for jazz/fusion guitarist Alex Hutchings. Alex has played a big part in the design process to ensure that the guitar meets his needs. » Waghorn AH6. A new stock Double Cut model in Swamp Ash/Brazilian Rosewood is now available for sale. See the Stock Guitars page for the full specification and plenty of photos. The first of two prototypes of our new Corax model (the first an 8 string, the second a 7) will also be ready shortly. Check our Facebook page for work in progress photos. The Acoustic Guitar Gallery has been updated with a 000-style in cocobolo and a rosewood J45-style. The prototype for the latest Waghorn electric model, the Sauria has been completed and you can find photos in the the Electric Gallery. The Sauria is available for sale along with a slowly increasing number of stock guitars for our showroom available to try out. Keep an eye on the Guitars In Stock page for updates and additions over the coming weeks. Bristol session guitarist Kit Morgan has kindly sent us some recordings of his 2006 Waghorn Hydra which you can play or download from our Multimedia page. You can also read his thoughts on his maple Hydra as well as feedback from some of our other customers on our Testimonials page. The prototype Kronos is now available for sale! Take a look at the Stock Guitars page for the full specification. Details of three other electric guitars including the prototype Sauria model that we will be finishing shortly have also been posted. These will also to be available for sale off-the-peg. The Bass Gallery has been updated with a custom 6 string J-style bass. The typical Waghorn 5-piece neck construction (maple and bubinga - this time with two dual-action truss rods) bolted onto a chambered alder body allowed us to build a strong six string bass and yet retain as much of the classic jazz sound as possible, with the help of Custom spaced Aero pickups. Lightweight Hipshot machineheads combined with modified body geometry ensures a perfectly balanced instrument with no nosediving. Just finished is a custom chambered body Double Cut in tobacco burst featuring Kinsman electronics, ETS individual bridges and Sperzel locking tuners. Check out the Electric Gallery for more photos. Also completed is another maple Mini-Jumbo acoustic, this time flamed maple with white binding and custom headstock and fingerboard inlays. Take a look at the Acoustic Guitar Gallery for more photos. Just finished is this semi-hollow body 'Supa' Tele in metallic lilac! Complete with DiMarzio pickups, Wilkinson tremolo, Sperzel locking tuners, chrome hardware and white binding. check out the Electric Gallery for more photos - and post your comments via Facebook. We have as ever been busy working on several custom instruments over the last few weeks including this recently finished Mini-Jumbo acoustic in Birdseye Maple complete with a custom headstock inlay. Take a look at the Acoustic Guitar Gallery for more photos. We have recently completed the prototype for the first of two new carved-top electric guitar designs; Kronos and Sauria. Kronos is our take on the modern super-strat while Sauria features a quirky, offset double-cut design. Both designs are available for custom order to your own wood and hardware specification, check out the Electrics page for more information.